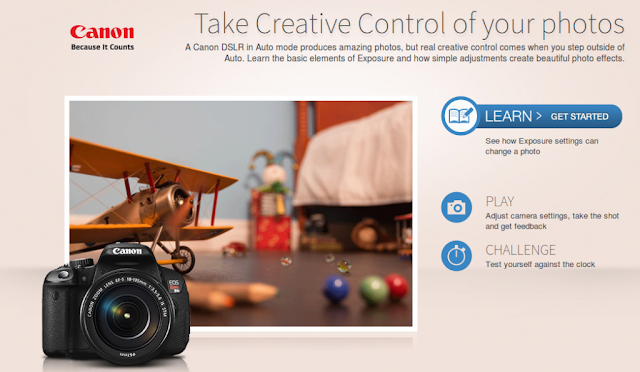 Canon Canada created a website with an interactive DSLR simulator, named Outside of Auto. The “Auto” refers to the Auto-mode on Canon DSLRs. Canon cameras take very good photos in Auto-mode, but the real creativity begins when one employs the other camera modes and use exposure and aperture settings creatively to enhance photography further. You can access the DSLR Simulator here. The website offers three sections : Learn, Play and Challenge. This is intended as an exercise of progression. First, learn the basics, then play around and get familiarized with the functions, and finally one can test the skill and knowledge acquired. The “Learn” section has three sub-sections : Home, Photography 101, and Tips. The “Play” section offers a virtual environment to try out your knowledge. All camera settings are available. The “Challenge” section gives you an opportunity to test yourself against the clock. Six different shooting scenarios can be simulated.